Now you can upload and share photos along with tweet message directly on Twitter.com website. This is possible using new ‘add an image’ option on user interface on Twitter website. 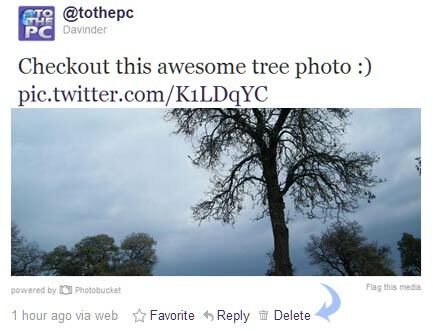 You can upload any image from your local computer and post it on your Twitter profile account in few simple clicks. This does not require any additional software or usage of third party services for image uploads. 1. Goto twitter.com website and login into your Twitter account. 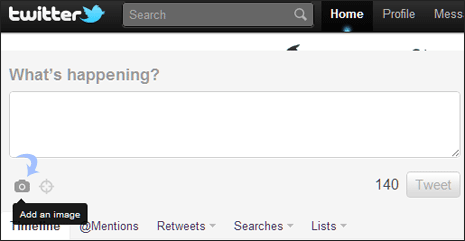 After successful login, click text box under “What’s happening” title. That box will expand display two icons at bottom left part. Click on “add an image” camera icon to start photo uploading on Twitter website. Note: If you do not see “Add an image” option in your Twitter account, wait for few days for Twitter to make it available to you. 2. In the new pop-up box, browse to select image on your computer and then click Open button. Selected photo will be added to the tweet. Now type Tweet message that you want to accompany the uploaded image. 3. Then click Tweet button to upload selected photo and post tweet message on your Twitter timeline. New tweet with photo attachment will appear on your profile. 4. You can click right arrow to quick preview uploaded photo along with tweet message. For bigger preview of the uploaded images, click on image URL (like http://t.co/K1LDqYC) in the tweet message. 1. To delete photos uploaded along with tweet messages, you need to remove complete tweet message. Once Tweet message is deleted, photo attachment with tweet is also removed. 2. So, open Tweet with photo attachment and click Delete button. Your uploaded photo will not available on Twitter. If your uploaded photo still opens on your computer even after deletion – make sure you delete browser cookies and history.